And if we want to be pendantic, those who were executed were "hanged," not "hung." Hanging is weird. Hanging a picture on a wall has the past tense of hung. Hanging a human being has the past tense of hanged. It is (somehow (Hooray for English (the language))), "He was hanged because he hung a picture incorrectly." I don't know why, but the form of execution has a different conjugation than any other form of the same verb. I can usually find a simile to illustrate my points, but I can't think of another verb like this. Some people bristle when they hear hanged or hung used incorrectly. Their blood boils. Their vision blacks out. Mixing up hung and hanged will make these people thoroughly cheesed off and mad as heck. Irate copy editors are no fun, but you can escape their ire. Read on. Observing the popular distinction between 'hanged' and 'hung' will not make you a better writer, but it will spare you the annoyance of being corrected for having done something that is not wrong. The standard rule for the past tense of hang is this: in almost all situations, you should use the word hung. I hung a picture of Noah Webster on the wall. After school, she hung out in the library. Use hanged when referring to a person being suspended by a rope around the neck until dead. The Salem "witches" were not burned; they were hanged. Justice Wargrave ordered Edward Seton to be hanged by the neck until dead. I was just going in on the big **** joke. We still don't know what his deckbuilding option will be? A Chance Encounter would really help, but they could just make him any 3+ event cost from any class. And just to be sure, he automaticaly lose﻿ the end of turn ressource? I'm not that fond of him over Jenny Barnes yet. Preston may not have been close to his father, but he would never sully his legacy by ending up on the wrong side of the law. As such, he also cannot have any Illicit cards in his deck. He can, however, include Survivor cards up to level two, granting him VIP access to a plethora of skill cards that he can commit to tests. So, most likely, Rogue 0-5, Neutral 0-5, Survivor 0-2, no Illicit cards. As for the end-of-turn resource... well, there is no end-of-turn resource. Assuming you mean the end-of-round resource--that is, the resource you gain in the upkeep phase--that goes into his resource pool as normal. Only resources gained from card effects go onto his inheritance. And even if he did use a card effect to gain resources during the upkeep phase (eg Madame Labranche), he still wouldn't lose them, because he only loses the inheritance money at the end of his turn. His turn is just his chance to act during the investigation phase: He puts four resources on Family Inheritance, takes up to three actions (plus any he gains from card effects), then clears Family Inheritance. The round is the full cycle of phases, from Mythos to upkeep; his turn is only a small part of that. I built a William Yorick deck around Red-Gloved Man (2 copies, plus Flares, etc. ), and he was able to do some flat-out amazing things. I was never quite able to get it proc enough to make it worthwhile. You need to kill an enemy then have good choices for what to do with the 6s. Setting this up made me have to make tradeoffs between what was the best play and what would get the man out again. Not saying it can't work, I just had a lot of trouble with it. wow, thanks for the explanation @rsdockery, didn't see it that way. Payday still wouldn't work and couldn't be include... but has access to take heart, chance encounter, flare and resourceful then. Worth a try. The game is trickling into stores. Any word on the remaining unrevealed cards? Yes. Give me the investigator backsides at the very least. The modifier on skull still applies so this card has no bearing on whether you hit or miss. The card says to cancel or resolve an effect on a mystic card an additional time that would trigger by a token of one of those types (the actual effect of the token does not resolve twice if that's what you are wondering). But it DOES resolve once due to the pull. Unfortunately, you can't just make the trigger on the mystic card resolve without pulling the token first, although that would be a fun upgrade! Could be really nice with Hypnotic Gaze too, especially against things with a ton of damage (like a particular beastie from Guardians of the Abyss). Too combo-tastic to rely on, but I think Eldritch is a useful enough card on its own. Yeah, in our episode first we looked at the cancel options (Rite of Seeking seems decent, and Diana likes this card) and then we looked at the additional time options (there aren't many, but Gaze and Song of the Dead are probably the strongest?). ohoh, ArkhamChronicle give us the number of a card anybody looked at in detail ... I can say someone receive his Circle Undone with a little advance, and is working on something like a youtube video ... am I wrong ?? don't hesitate to say about the rest of the cards XD ( but I know that if FFG bring the box to you, you would not reveal a lot about, for keep their trust ) . Sacré bleu! Who knew that we spoke such amazing French. Magnifique! Early product? Ha ha ha ha ha ha. We wish. Oh and card number 25** is the Seeker card “Connect the Dots”. Nice! Wouldn't that Eldritch Inspiration make Recharge loose all risk? Then again as the card is written, you wouldn't get the charges if a symbol was revealed, right? Or is it written in a way that tells you to add charges if you do not discard the asset? It would ignore the discard effect, but it's still considered revealed so you wouldn't get the charges. Everything is on a product by product basis and we don’t know until it actually turns up. Or doesn’t. Something can arrive at 6pm the day before release. Which, if your daylight stops at 3pm, is terrible. Sometimes we are told on release day or the day before we aren’t getting a copy and it is a race against time to find a retailer who still has it in stock. We have made a couple of six hour round trips to London to pick up stuff like that. We always put in the credits if we got a review copy or not. We have no Circle Undone and genuinely no idea if we will see one before release day. Which is terrible as there is so much to talk about! 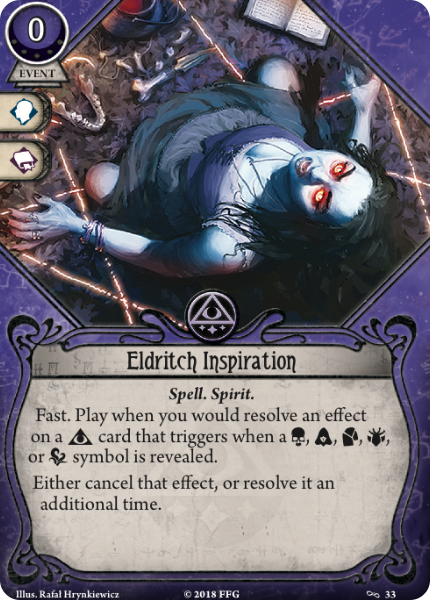 New Slot, New Card Type, SIX investigators, Prelude investigators, Hunch decks, Twilight Lodge, Shadow locations, and insight traits up the whazoo! Let us know if you want us to fill in one more blank on the list won’t you. All the Investigators have now been spoiled on Reddit (probably by someone who purchased a copy from a shop) before we could release our spoilers and before a review copy came anywhere near us.